Google has created an Apple iPad friendly version of its popular Gmail web service, expressing the company's excitement at the "upcoming wave of tablet computers and the possibilities they bring." Google has been a major player in iPhone apps since its launch – producing popular applications and ensuring that anyone arriving at a Google product webpage through the mobile Safari browser gets a tailored offering. Engineering Manager at Google, Alex Nicolaou explained that the arrival of the next generation of Apple device has sparked great excitement at Google about tablets – not least, presumably, because of the prospect of a Google operating system like Chrome OS or Android on the platform. "When the iPhone and Android devices came out, we started building for advanced mobile browsers and optimizing the Gmail interface for touchscreens, culminating in the Gmail for mobile HTML5 web app," said Nicolaou on the Gmail blog. "As portable devices continue to evolve, we're excited about the upcoming wave of tablet computers and the possibilities they bring. "With [the] release of the iPad, we're launching an experimental two-pane user interface to take advantage of its large touchscreen and tablet form factor. 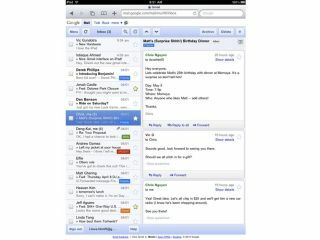 "Building upon the Gmail for mobile web app, this new interface displays your conversations on the left and your messages on the right hand side. The company admitted that there is a steep learning curve with new devices, and asked for feedback on potential improvements to its app. "We'd like to hear any ideas you may have on how we can make Gmail better for the iPad so don't hesitate to let us know via the 'Send feedback' link at the bottom of your inbox on iPad." To try out Gmail out on the iPad, just go to gmail.com in Safari, although it's obviously only available in US English for now, warns Google.